Hi there! My name’s Wez Maynard and I’m head of design at Vertical Leap. Originally from the Isle of Wight, I moved away to complete a design degree firstly in Bournemouth and then in Nottingham. Since then I’ve been privileged to have worked in some excellent brand and digital design agencies, even spending some time in Whistler, Canada supplementing my design duties as a ski instructor. Today, it’s Vertical Leap I hang my professional hat from, and consider myself fortunate to lead such a talented and diverse team. As head of design, it’s also my privilege to give you a little insight into part of our process – namely, why our design team approaches each and every new project armed with data. There’s no doubting that design inspiration can come from anywhere. Sparks of genius can ignite from listening to music, looking through books or just taking a simple walk. The paths to design enlightenment are virtually endless. What’s less certain is the time frame you can assign this ‘design gestation’ to. But when it happens – your ‘eureka’ moment – the excitement and relief after the hours/days/weeks you’ve spent on a design problem melt away. You’re now confident that what you’ve achieved is going to be looked upon by your client, your peers and maybe your boss as something really great. This is a problem. A very real and damaging problem that is all too common in the design industry and in particular, the web design industry. The by-product of which is often clients who have overpaid and are ultimately disappointed in the results of their new digital product, or agencies who have over delivered and are out of pocket. By hoping that a designer working on a project will simply conjure up something that will fulfil businesses’ requirements on a marketing/brand/financial goals level, is as foolhardy as the designer who thinks they can. The time spent trying to create a new website design has a cost and, of course, this is a cost either the agency or the client is going to have to pick up. Designers aren’t sages and I’m speaking to you as one. In my experience, the only way to really achieve consistent client success stories over and over again is to begin with data. Lots of it. 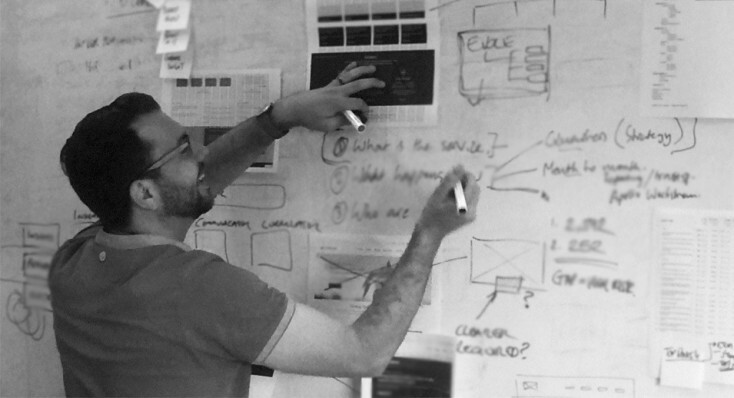 Our design team begins every new digital project by gathering and analysing data relevant to our client. A number of industry standard systems can already offer excellent data insight. Using Google Analytics, for example, you could track actions on the existing website and find out exactly how website visitors are converting on the site. This will help with establishing which current website macro and micro goals need re-thinking or keeping. 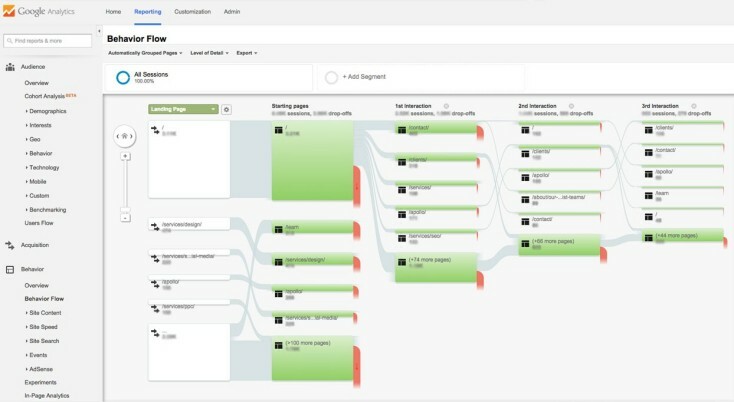 A behaviour flow diagram, inside Google Analytics, can show you exactly how users are navigating through a website and, importantly, where they’re leaving. Crazy Egg provides on page analysis so you can see exactly how website visitors interact with a website. For example, heatmaps tell us where users are clicking (or where they’re trying to click) and scrollmaps indicate how much of your pages users actually scroll through. 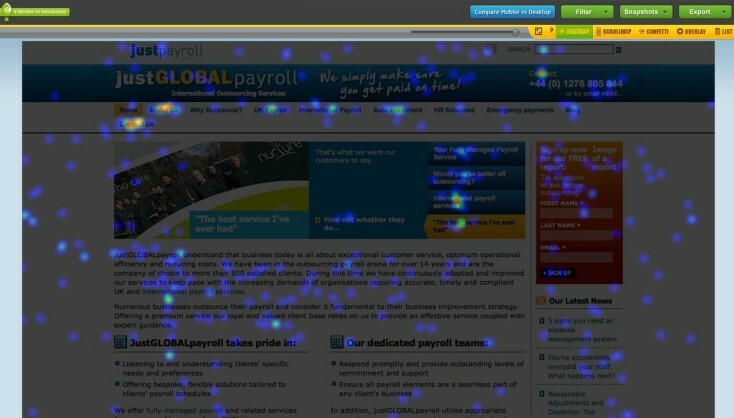 A heatmap showing where users click on this clients old homepage design. The confused nature of the patterns helped us to simplify the new design, offering a much improved user experience. For our client, Just Global Payroll (JGP), we established erratic user behaviour (found, in part, through heatmapping) was causing users to become confused and disengage. The new website simplifies this information and presents a much easier path to user conversion. Since the new website launched, conversions have increased by 61% and page views have risen by over 230%. The old Just Payroll services on the left is a stark contrast to the new design on the right. The new website offers a much simpler conversion path for the user to follow. Our in-house big data platform, Apollo Insights, does the majority of the heavy lifting when it comes to data gathering. Apollo gives our design team access to everything about the client’s existing website there is to know, about the sites that currently link to them and everything about our client’s competitors. This data can produce real insight that is invaluable during our initial research phase. A holiday company recently came to us for a website re-design. The client was happy with the site’s current performance, but thought it was time for a change. Our client believed its existing website was best in class already and wasn’t looking to push the envelope or be innovative with a new design direction. Using Apollo, we quickly established that although it was true the list of competitors the client provided were pretty poor (certainly from a usability angle), none of these were in direct competition from a search engine result pages (SERP) perspective. Apollo allowed us to show our client who they were in direct competition with. This completely changed their point of view on the design direction that was required. Seeing the different class in competition, our client realised it would need to re-align the brand and launch the new website alongside a fresher, more modern marketing campaign. After presenting our data findings, the client decided that rather than rush into a website refresh (and possibly waste money now), the best course of action would be to get the new brand design right and then move onto the website (to save money later). Real data-led business insights like this would be impossible without the use of a system like Apollo. This image shows us how our holiday client stacks up against its competitors in search, on a daily basis. 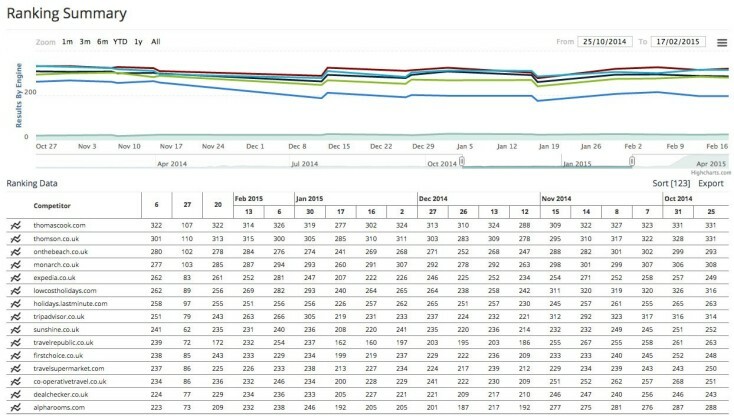 The table shows us how many relevant searches a day each competitor shows up alongside our client. Thorough data research can sometimes lead to pivots in business stances. Recruitment consultants for the property industry, Property Personnel, was already an existing agency client with Vertical Leap. Our design team was brought in when the SEO team and the client established the existing website had hit maximum saturation. The existing Property Personnel website relied on a content-heavy homepage and a website structure built around content pages packed full of informative copy – it also had a small job search facility that appeared more of an afterthought than anything else. Apollo gave us access to a specific set of data that would completely transform the Property Personnel online business strategy. We discovered that over 60% of the website’s pages were, basically, dead. They received no interaction from visitors or hits from search results. The real interest and focus was around the job search facility. We capitalised on this information and made the job search facility integral to the new design. Aside from visitors being up 43% and search visibility rising to 256%, conversions have grown 375% and, most importantly for us, 95% of the website is being used by its users. The old Property Personnel (left) vs the new Property Personnel (right). As you can see – we’ve made much more of the search facility, which has benefited the website greatly. By incorporating data analysis as part of any digital project, you ensure that a large percentage of key decisions throughout that project’s lifecycle are made on top of strong foundations. Some designers might argue that a reliance on data can restrict their ability to be creative – that somehow, data knowledge is detrimental to the design process. I believe that data, if interpreted properly, can be invigorating to any designer’s normal working process. It can offer actionable insights and reveal areas of investigation previously not imagined. 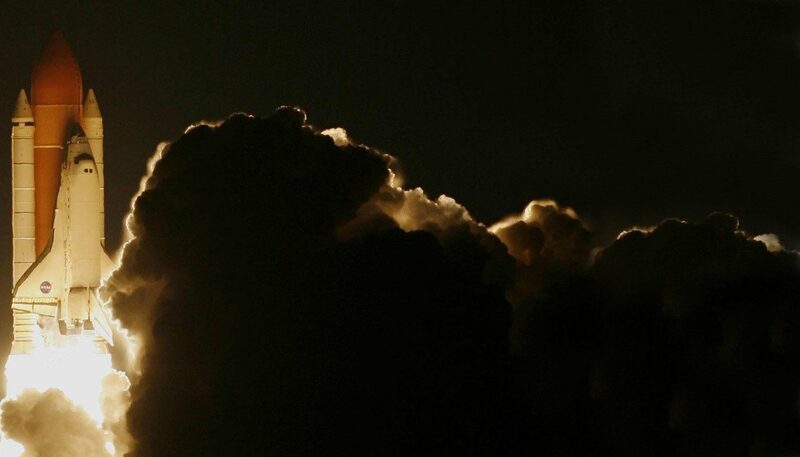 That amazing ‘eureka’ moment doesn’t disappear, it just arrives on time and on budget.